The setting is Europe in the time of Elizabeth I. In England, France, Spain and the Netherlands, Catholics and Protestants compete for power and influence. In this politically unstable environment, resourceful operatives and courageous secret agents plot to secure power for their rulers. The balance of power shifts back and forth amidst foiled assassinations, successful rebellions, and futile invasions. And not infrequently, those who sympathize with the weak are expelled from the country. The real enemies, then as now, are not the rival religions. The true battle pits those who believe in tolerance and compromise against the tyrants who would impose their ideas on everyone else — no matter what the cost. Who will best exploit the changing power conditions in Europe to win the game? 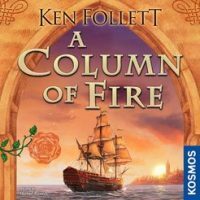 Add a Review for "Column of Fire"